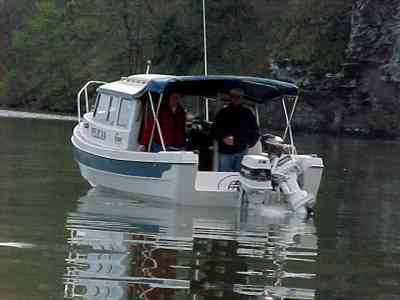 Most boaters buy their boats to 'get away from it all. The boat will force them to relax on their days off, weekends, or holidays. But, we have discovered, many boaters find the watery world anything but relaxing. Why? What can we do to find the relaxation we seek? Here are our thoughts on the matter. -----Relaxing aboard means different things to different folks. For some, it means competing with a fish to see who is more intelligent (the fish usually wins). For others, it means kicking back and sipping a sundowner watching the sunset over the aft rail. Some look for a weekend getaway 'out with nature' away from the hubbub of the workaday world. There are as many definitions of relaxing with a boat as a fertile mind can conjure. These folks may head out for a few hours after work. Or take a Saturday fishing. 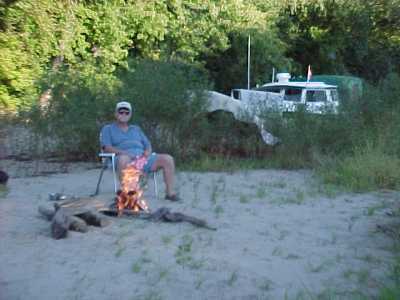 Or maybe go for a family 'campout' weekend, either on anchor or ashore at an island or a marina. They constitute the majority of boaters. -----Some folks buy a boat to travel. These are the long-distance cruisers. You know - cruise off over the horizon into the sunset and live happily ever after. They require a little more in the way of creature comforts than the Day-trippers. Their boat is their home for long periods of time. This is not easy. Imagine stuffing a bedroom, kitchen, bathroom, living room, attic and garage into something that floats. Most Cruisers can't, so they buy a boat the size (and price tag) of a house. Land lubbers come aboard those yachts and coo over the carpets, the diffused lighting, and the hot tub. A very few cruisers live on small boats - either because their wallets are smaller than Bill Gate's, or they want to trailer their boat, or they are minimalists (or should that be read, masochists?). These folks might buy a C-Dory. -----But, no matter the size, the goal is the same. To travel along in a tranquil, calm, soothing, watery world - away from the maddening crowds. 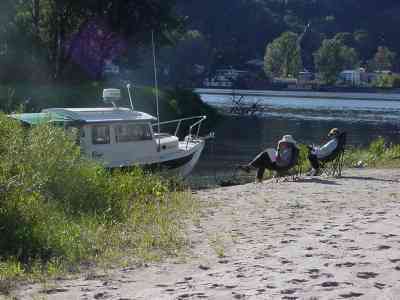 -----Day-trippers and Cruisers share one thing in common - most 'go boating' to relax. However, it is our observation, that very few do. El and I have pondered this paradox for long hours sitting in the cockpit sipping sundowners, watching boats frantically chugging around us. Why can't most boaters relax? Pop a can and let's chat about it. -----Most importantly, we have decided, it's our culture. Everything is in fast forward. Folks are busy, busy, busy. MTV flickers in the background. USA Today gives snippets of news and the TV gives soundbites. Folks roar down freeways through rush hour and hate it. (Grandpa went on a Sunday drive, and loved it). Everyone works overtime. We all have time-saving devices but spend the 'saved' time frantically running around buying and repairing those very devices. No one walks to work so we have to work out. We fall into bed exhausted. Most of our busi-ness is self-imposed, driven by advertisers and perceptions of what it means to be a good parent, good worker, good boss, good-anything. So, we buy a boat to relax - but relaxing is in the head - not on the water - and many boaters aren't relaxed. -----El and I were putt-putting along the Flint River last March. It was one of those glorious Georgia spring days when the leaves are just bursting with fresh green-ness. The air was as soft and warm as velvet, the sun streaking through overhanging boughs, cardinals were competing with mockingbirds to fill the languid air with song - a simply marvelous morning. Suddenly, it sounded like Indy. The roar of megahorsepower engines increased into an earsplitting crescendo as a fleet of low bass boats bore down on us. We hugged the shore as the armada shrieked past in a blur of spray. -----At the next marina we learned from the owner what that was all about. "Why, hon, don't you know? Those were bass fisherman." -----"They were what?" El asked incredulously. "Fishermen?" We tried to contemplate fishing at 60 knots. -----"Why, sure. Today's a Bass Tourney," the lady answered. "You know, they compete to see who can get the most and the biggest in a set time. So, when the gun goes off they head out to their favorite spot, snag as many as they can, then zip over to their next spot, and so on - all day long. Then they fly home here quick as a wink to beat the gun and tally their fish. There's Big Money. Why, they pay thousands just to enter." -----El and I shook our heads in naïve disbelief. We thought fishing was dabbling a line and feeling the sun on one shoulder as your cares slipped off the other. Our frenetic competitive culture has even penetrated the quietude of fishing. -----"How about meeting us for a slow` cruise down the St. John's," El asked some cruising companions. -----"Can't," came the answer. "Got a reservation at the marina in Fernandina Beach tomorrow and the next night at St. Simons." -----"But you don't have to be home to Missouri until fall. The St. John's is one of America's most beautiful rivers," El continued encouragingly. -----"Can't do it. We have this schedule and all the reservations. If we break it, everything will fall apart. Have a good trip." -----We have sailing friends who circumnavigated. We visited with them as we came along the Chesapeake last spring. "Of all your experiences around the globe, if you could do the trip again, what would you do differently?" El asked while relaxing on the deck of their delightful shore-side home. -----"Take more time," Judy said. "Five years simply wasn't enough." -----"Agreed," Ward nodded assent. "And don't have a schedule. We never knew what we would find on each stop - and because of our schedule, spent too much time in some miserable places and too little in some marvelous spots. We had only two days on the most glorious South Pacific Island we had ever seen. ... or ever will see," he added wistfully. -----Sure, plan a rough itinerary. But don't fix any times or dates to it. Yep, you'll find a marina full someday - but the anchorage around the corner will probably be quieter. 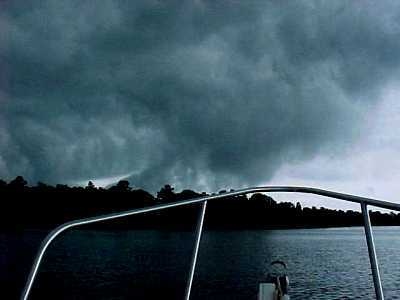 -----The biggest weather-related troubles we've seen are with boaters who have a schedule and head out to meet that timetable regardless of the weather. Probably 75% of the boaters we've talked with who have been knocked about by weather, when asked why they were out there in the first place, say they "had to get home" or "we were meeting friends at the marina" or some such agenda-related reason. This is a big problem for the Day-tripper or Weekender. They have to get back to work. Have a chat with the boss, and explain that there might be the occasional day when you'll be late or miss work. Chalk it up as a sick day or some such. -----Another 20% hadn't paid any attention to the weather in the first place. Every boater should carry a 'weather radio' with them. Subject yourself to all the temperatures in 15 local towns. The NOAA weather forecast will finally come. Arnold (or Agatha), the computer voices, can be a little disconcerting and the pronunciation of local place names amusing, but NOAA is the best source of weather information for most boaters. If you are home or in a marina preparing for time on the water, check your computer or the weather channel. It also helps if you are knowledgeable of weather signs and warnings given by wind direction, clouds and the like. -----Only about 5% of the boaters we've queried 'got caught.' Truly and honestly ensnared by a rapid change in unpredicted weather. -----So weather is not a good excuse for tension afloat. In fact, it should be the opposite. When bad weather is predicted or happening, drop a hook in a protected cove or tie up at the dock. Forget the schedule, pull out a good book, pop a can and put your feet up. Our best days of reading (and, by the way, the days when we do the writing for this site) are almost always 'weather days.' As cruisers, we look forward to those splendid days of gently swinging on the hook, rain pattering on the cabin roof, and the pot bubbling on the stove. 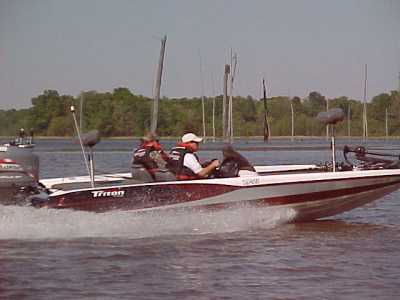 -----Meeting others for fishing, cruising in tandem, or just going out for a day trip plants a tab stop on the time ruler of life. And, like any time commitment for a boater, it is fraught with the hazards of weather and distance - perhaps forcing one to be boating when common sense would say 'stay in harbor' or 'slow down.' Sometimes, there is a span of two tab stops -a point at the beginning and the end, like a two-week vacation. Other people, like your boss, have marked the limits. It's hard to relax when you have three days left on holiday, you're a hundred miles from home port, and the sky is turning black and ugly with the approaching cold front Arnold has predicted to hang around for a week. -----The goals can be short term - "I'm staying out until I get three fish," or "Let's get to Pretty Hole for the anchorage tonight." When it turns out the fish aren't biting, or Pretty Hole is too far over the horizon, one can hardly lighten up as you pick your way through the rocks and swells in the dark. -----Long-term goals can also be pitfalls. "Let's do the whole Gulf Coast from Mexico to Florida on our (two-week) holiday." "We're doing the Great Loop" or "We're off to the head of navigation" or "Florida to Canada, yeee haw!." Sometimes such goals keep the focus so far ahead (Florida, or Canada) - both in distance or time - that you can't kick back, put the feet up, and enjoy the present place. -----The goals of others are especially difficult to live with when cruising, since others are involved. Your own cruising plan can be held secondary to weather or a sudden whim. Goals set by others can be difficult to alter. -----A good companion can often help the compulsive keep perspective. -----The old adage, Change the things that can be changed; accept those that can't; and have the wisdom to know the difference, certainly holds true on the water. Some things can't be changed - seasons, family crises, holiday dates, weather. Adapt to these as best as possible. -----Beware of schedules -- you can set a time and you can set a place but don't ever set a time and a place to meet others. -----Beware of goals set by others. Spontaneity is fun, and often affords a pleasant change from otherwise well-ordered lives. Commitment to meet others should come with the caveat: "weather and cruising conditions permitting." -----Therefore - be a little contrary to the culture - Get on your boat and Relax.